The IVV Olympiad is held every second year in the country of an IVV member. It is a celebration of Volkssports and everyone is invited to participate. Olympiad Volkssport events include walking, swimming, biking, and sometimes other non-competitive sports. Social and cultural activities promote harmony, mutual understanding, and friendships among those who attend. 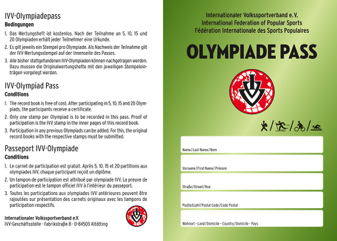 To enable our walkers to collect their Olympiads in a pass, the new “Olympiade Pass” has been published. Please find the conditions on the rear page, see below. To inform all walkers, please publish this information on your homepage. Any previous Olympiads can be added into the book. Congratulations to the following walkers who have participated in all 15 IVV Olympiads from 1989 through 2017!